Tell me about the genesis of the four-man rotation, and what the thinking was coming in. It was implemented pretty much when you and Dan made the switch, right? I assume this was your baby. No, it was June 18. OK. I interviewed you in 2006 and I asked you about the four-man because this is a fetish of mine, and you said, “Oh, that could work. I don’t know.” So I wasn’t sure if you were a proponent of it or not. Well, you know what? In 2006, that’s exactly where we were at. I think it was an idea that was brought up. I know Dan and Bob McClure — Bob McClure brought it to me one time, he brought it to Dan, and it was discussed and talked about way back then. No, back in like 2002. Oh wow. Not long after Dan took the job, really. And [Bob McClure] was with us at Triple-A. He was down there as our pitching coach, and he really felt like some kind of system like this would be good. So it had been talked about and studied for a long time, thinking that, you know, this may be a way that we could go about our pitching here, and trying to figure this out, knowing that anything over 75 pitches, the third time through the order, all the stats will show you that everything increases. For the best pitchers, everybody except Verlander, pretty much, is susceptible to that. That goes across the game, to any ballpark, it doesn’t matter, in the history of the game. Knowing that, and trying to put this — it never really got to a point, I think, where we were — we were always serious, I shouldn’t say that. It just got to a point where we felt like, now is the time to try this. It was always just an idea of something that was not what we’re doing now, but something that could be of merit and value to us. You had the cushion because it was a losing season and because the pitching staff was not performing well, you could experiment with it in real time, whereas if you’re in the race, you can’t. Is that kind of the idea? You know, I think so, to some degree. I think that gets thrown out. But I also think that, I mean, more for us, if we continue with five right now, we’re really getting to the point where we’re taxing our bullpen. Part of it was, how are we going to compete in these games? I think that’s what kind of led to it. I don’t think it was a losing season, and that type of thing. It was more of, we need to compete in these games and try to put [ourselves] in position to win. That was an avenue we thought of, because the way we were doing it, with the pitchers not giving us any length at all, it was certainly an issue. OK, you’re saying the relief pitchers were getting taxed, but of course relief pitchers get taxed to a certain extent when the pitch limit is 75 anyway. Then you’re going to have to use six relief pitchers. No, but we also had three guys behind that were built in to add to that starter pitch count. And that’s where, to me, you can go back-and-forth all day with this. To me, there’s an aspect of being able to execute pitches on the mound no matter what system you have, or how many guys you have down in the bullpen. At some point, somebody’s gotta be able to put the ball where they need to in a major league game to get outs. And I think some of that, whether it’s this system, that system, that aspect of it has got to be what you do out there as a professional pitcher. I was going to ask you about the politics of this. So when you brought this forth, you can’t drop it from the sky. You have to go talk to the pitching coach, the manager, and also the pitchers. And one thing which struck me when it was brought up, and this was in my mind forever, was if you’re going to do this, players’ salaries are affected, especially in arbitration, by old-school stats. By wins, and strikeouts and so forth. You’re not going to get that many wins if you’re throwing 75 pitches at Coors Field. You’ve just gotta get through five, and that’s not even that easy. And it could potentially hurt their financial prospects down the road. So when you brought this up with them, was there any push-back about that, or even any mention of it? Because that was one of the first things that would strike me. Maybe it will help the team, but it could potentially cost a guy several million dollars over the course of his career. I think there’s always a level of trust that a player has to have in how people are going to look at things, knowing their role and what they’re asked to do. I know everybody here talked about that. That was talked about moreso in the offices than it ever was — I never heard a player talk about that. But people were cognizant of the fact that the players might react that way? And you mentioned putting the ball on the ground as well. One team that struck me as making a concerted effort, quite frankly, to try to have a ground-ball staff this year was the Indians. Some of those guys were holdovers – Justin Masterson slings the ball, he’s got a 55 percent ground-ball rate, or something like that. But they picked up Derek Lowe, you won’t find a more extreme worm-burner than that. And they just had a staff full of them. It really didn’t work, not a good season for the Indians. But I remember writing an article in November, a glowing article, “Oh, they’re going to be worm-burners, I love this; it’s going to be great.” And I’m wondering about that strategy here. Now, yes, you have to get guys out by hook or by crook, but all things being equal, is that a viable strategy — to go after guys with a heavy ground-ball rates? Yes, Felix Hernandez has a heavy ground-ball rate, too, but I’m talking about pitchers who are so-so, don’t cost $20 million a year, but maybe just have that great sinkerball or what have you? I think so. I think it’s a little more than that. I think ground-ball rate is definitely a key; I think throwing strikes is definitely a key. Those two aspects of it are there. It’s funny to me, when you look at ground-ball rates. Typically the bigger ballparks, those guys tend to be fly ball pitchers. It’s much easier to just throw a four-seamer out over the plate, let ’em hit a fly ball, who cares? They try to pull it, it’s not going out because I located it away. That’s fine, but those things can kinda — the difference of your ballpark plays into it. I think, for us, you’ve got to get the hitter out, and that might include a ground ball or not, depending on the situation. But you can pitch to the hitter, or pitch to get a ground ball, depending on the situation of the game, but you’ve got to be able to get the ground ball when you need to get the ground ball. And you can’t let the ball get hit in the air when you need to put it on the ground. That’s the true difference to me, and whatever the percentage might be is fine, but if this guy can get people out, with it being a ball in the air or a strikeout, I’m good with that, too. But when you need a ground ball, especially in a ballpark like this with runners on, you’ve got to be able to get the ball on the ground, and I think that’s the biggest thing. I wrote a book about the Rays last year, and one thing that I did was systematically go through the other GMs in the division. And one thing that the Orioles and Jays and Rays had in common was that they never attracted big-ticket pitchers through free agency. Part of that was risk avoidance. If you’re paying $150 million, it’s a risk, there’s no question. There are a lot of Barry Zito stories out there, with due respect to Barry Zito. But it was more than that. It seemed that there had been attempts made, and just, the players didn’t want to go there because they were going to get beaten up by the Yankees and the Red Sox; it was not going to go well. This is the extreme version of that. The last time that I can think of that the Rockies went out and got two big-ticket free agent pitchers was Mike Hampton, lover of Colorado public schools, and Denny Neagle. They’re good schools, by the way. So, that’s all true, and obviously the failures of Hampton and Neagle, people have long institutional memories. I’m sure that weighs into it. But there’s a certain point at which an agent is just going to say, “Yeah, we’re not — no. All things being equal, we’ll go to L.A. or San Diego or anywhere else.” How much does that play into your calculus? Do you just say, “We have to just hoard as many young pitchers as possible because we just cannot get guys from outside the organization?” Or if there’s a guy there for $90 million, are you going to take a shot at him? How do you approach the method of pitcher acquisition, given their avoidance to it, and also the history, going back a ways, of what’s happened when you guys tried to do it? I think we tried doing all the avenues. Trade is one that you didn’t mention. Yes, of course. And that was one with Guthrie, for example. [Drew] Pomeranz, [Alex] White, [Joe] Gardner … but we’re going to do all those. There are pitchers that feel like they can pitch here, and have good history here. And I think that is part of this equation, too. 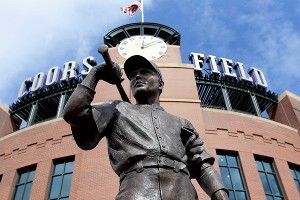 There are pitchers that don’t seem to be bothered by pitching at Coors Field, it doesn’t intimidate them. Yeah. He comes in here and it’s not an issue. There are some pitchers that, no, they would not want to come here. They may be extreme fly-ball guys, or have a tendency to give up a lot of balls in the air, that would not want to pitch here. I’d say it’s all of the above. I think we still go after, and do everything we can in terms of the draft. We’ve leaned heavily on our Latin American programs, in terms of developing pitchers. Guys like Ubaldo who have come through. Yeah, [Jhoulys] Chacin, throw Rogers in there, and anybody else. I mean, that’s where we’ve leaned. How are we going to be able to get arms? We had a college market, which was difficult in a lot of ways, because some of the starting pitchers that we liked seemed to try to price themselves out. Greg Reynolds, the high draft pick who didn’t work out? Yeah, Greg Reynolds is one guy we’ve taken. But we really haven’t gone after a lot of guys high in the draft. [Tyler] Matzek’s another one, a high school left-hander we took, but we really tended to sway toward position players, knowing we were focusing on Latin America on our pitching. And it’s gotten to the point where trying to produce as much as we can on the mound is difficult, too, because now the younger pitchers, like we’ve seen here, it takes some time. I mean, Aaron Cook was up-and-down. [Jason] Jennings was probably the one that came right up and was fine. Jeff Francis had a little scuffle early, but kind of settled in. It’s a difficult environment to develop pitching, and it’s a difficult environment to acquire pitching. At the same time, that’s what makes it so fascinating, to try to do something that is what some people would say is either a restrictive environment, or limited in terms of what you can do as far as avenues to try to figure this out. That’s what makes it fun. I think the general rule around baseball, for the visiting club, the home club, whatever, is the curveball is probably the worst pitch here. One that was here … Darryl Kile. He threw a curveball, he had a good curveball. But didn’t pitch well in Colorado. But that’s what I mean. Over time, there have been plenty of things to go on, that you have either in your recollection or that you can study to try to figure out, and I think it’s to the point now, 20 years of logging data and players running through here, that you can pretty much put yourself into position to dig into this and have statistical information that you can look at, and it’s tangible. It’s not what people think and what this guy, one guy, experienced or anything like that. It’s truly something that can be studied, mapped out, and there’s a lot of lessons that have been learned here that we can move on from. How did things change [when you and Dan O’Dowd swapped roles]? What happens now? What is Dan in charge of, and what are you in charge of? You’re both handling things, essentially. I’m in charge of the major league club. So I deal with the day-to-day duties and a lot of the decision making of the major league team. But Dan still has input. I still talk to Dan on a regular basis. We still go over things and talk about things that are going on. I think a great aspect of Dan is him telling me that he’s going to provide input, but he truly wants me to have ownership of what we do down there. So that’s good and a pretty hefty responsibility as far as what goes on here and what we do. But I think, at the same time, it’s with the idea of me coming down here and working with the staff and talking to the players, and experiencing everything we experience to try to formulate a plan that, aspects of it might be here long after I’m gone. Right. You build a program — the Oriole way, the Rockies way, whatever. Exactly. How we handle things and how we do things here that are unique to any other of the 29 clubs. I wanted to ask you about [Troy] Tulowitzki. When he’s healthy, [he’s] one of the three or four most valuable players in baseball. A fantastic player: fields, runs, he hits for power, all of that. But he’s struggled with injuries; this isn’t the first time. And you’ve got this kid [Josh] Rutledge who looks pretty promising, maybe even a little bit better than you guys might have expected off the bat — granted, small sample, but there’s some potential there. Any thought to Tulo, despite his fantastic defense, playing in a position that would be less stressful in an effort to keep him in the lineup? Third base, second base, or is it, “Tulo’s a shortstop, sign him for the next 10 years, we’re not worrying about it”? For me, not at all. You’ve got, as far as I can tell, the best shortstop in the game. I don’t know why you would look at that now in terms of health and all that, I think that will play out. I think there’s some concern over some injuries that have happened, but I think, at the same time, you know, it’s a lot like he’s going to have to play his way off of that position. I also think that Tulo’s been a guy here that has, you know — he’s a grinder. Both mentally and physically, he is grinding out, trying to help us win every night. And through that, I think he’s running into some injuries or there are some times where maybe he could have taken a day off and mend a little bit. Or we could have been a little bit more selective in terms of his playing time in all that’s gone on, and he’s never even come close to being a guy that would allow anyone to take him out. I think that’s something, moving forward, we may have to look at, but I don’t — as far as a position change, I don’t think that’s anything to look at right now. You’re always looking for, if you’ve got the best player at a position in the game, I think it’s a little foolish to think, unless you get to the point where you truly believe that that’s the only way to keep him healthy, I don’t know what his injuries are caused by. I don’t know. And finally, just because I’m on this kick lately: For Major League Baseball, this is a great financial period. Baseball’s so healthy now, and the new national TV deal — forgetting about local, which is going nuts — is going to bring in an extra $26 million per club, on top of what teams are already getting. What are the Rockies going to do with an extra $26 million? How would a team best spend that money? It’s a new windfall that’s a significant amount of money. What do you do with it? How do you improve your club that way? I don’t know, I haven’t seen any of that money yet. No, I think it all depends on where you sit that day, or what your personnel is. I don’t know that I could say right now. For us, we need to pitch better. I don’t think we’ve ever been in a position where we’ve held back money. And I don’t think there’s a lot of clubs that have ever done that, to tell you the truth. I think everybody’s actively going out, no matter what people think, actively trying to go out and improve their club. All these teams. For us, I don’t think it’d be anything where we’ve ever held back any dollars. We definitely spend up to and sometimes beyond, probably, what we can spend. And a lot of them are extensions. [Todd] Helton, Tulo, [Carlos] Gonzalez, these are significant contracts for your core players. What next season will hold, we’ll have to wait and see, but I really do like our talent. And I don’t think people give us enough credit for the talent we have. It’s here. It’s just hurt.